The most important factors for men who shop XL sizes are access to a merchandise selection ranging from current trends to their favorite classic looks, plus the confidence that their selections will fit comfortably. Casual Male Retail Group, Inc. (Nasdaq: CMRG), the leading retailer of men's XL apparel, has opened a new Destination XL® store in Raleigh, North Carolina today. Located at Crabtree Valley Place, 4601 Creedmoor Road, the DXL® store is a new men's superstore catering to the fashion needs of men who wear sizes XL and up. The most important factors for men who shop XL sizes are access to a merchandise selection ranging from current trends to their favorite classic looks, plus the confidence that their selections will fit comfortably. According to the U.S. Census Bureau, approximately 50% of U.S. adult men have a waist size of 40” or greater. There are currently few options in Raleigh for these men to purchase fashionable clothing that fits and often they are relegated to shopping the end of the rack at the major department stores where they are forced to choose from the limited selection available in their size, making Destination XL a greatly needed addition to the marketplace. Destination XL offers more than 100 brands from CMRG's existing apparel businesses, Casual Male XL, Rochester Big & Tall, and ShoesXL, with selections ranging from private labels, sure to appeal to the value-conscious shopper, to the hottest designer brands such as Lacoste, Michael Kors, DKNY Jeans, Lucky Brand Jeans, Robert Graham and more. The DXL store carries product assortments in sizes starting at XL along with tall sizes, plus waist sizes from 40” and up as well as shoe sizes 10-16 in widths to 4E, all in a spacious, welcoming environment built just for men. The DXL store provides a unique shopping experience with conveniences such as knowledgeable associates to help customers put together the perfect outfit and in-store tailoring to ensure the best fit. “The DXL concept is an emerging and innovative retail offering that is attuned to our customers' needs and we are excited to open our latest store in Raleigh just in time for the holidays," says David Levin, President and CEO of CMRG. "Our customers seek choices, value, convenience and a unique shopping experience which DXL stores offer. We are confident that our success in other markets will be replicated here in Raleigh." During this holiday season, Destination XL is teaming up with St. Jude Children’s Research Hospital for the ninth annual St. Jude Thanks and Giving campaign, a unique holiday program that raises awareness and funds for the pioneering research and exceptional care provided at St. Jude. Customers who shop at the DXL store now through Saturday, January 5th, will be asked to donate to St. Jude at the register when making a purchase. This is the eighth year the company has participated in the campaign, having raised nearly four million dollars for St. Jude during that time. This new store joins the 43 current DXL locations in 26 states. The Company plans to open a total of 35 stores during 2012 and over 200 stores over the next several years as part of the company’s transition from Casual Male XL to focus on growing the Destination XL brand. Furthermore, DestinationXL.com offers a multi-channel solution similar to the DXL store experience and features state-of-the-art functionality that enables customers to shop across all brands and product extensions with ease. 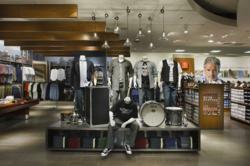 Visit http://www.destinationxl.com/mens-big-and-tall-store/static/storefinder to see a panoramic view of a Destination XL store. Casual Male Retail Group, Inc. is the largest retailer of men's apparel in sizes XL and up, with operations throughout the United States, Canada and in London, England. The company is currently in the process of transitioning from Casual Male XL to focus primarily on the Destination XL concept. Casual Male Retail Group, Inc. currently operates 376 Casual Male XL retail and outlet stores, 12 Rochester Clothing stores, 44 Destination XL stores and direct-to-consumer businesses which include several catalogs and e-commerce sites, including http://www.destinationxl.com. The Company is headquartered in Canton, Massachusetts, and its common stock is listed on the NASDAQ Global Market under the symbol "CMRG."